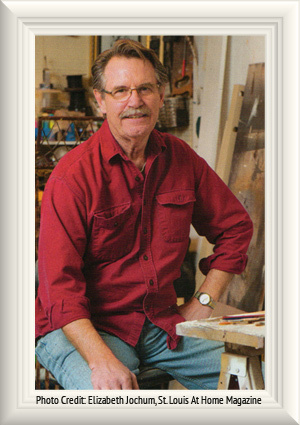 For nearly 35 years Charley has been perfecting the art of decorative and architectural painting in fine homes, commercial spaces and restaurants throughout St. Louis, St. Charles and Metro Southern Illinois. From incredible faux finishes, staining, stenciling, and distressing to imaginative trompe l'oeil, the artistic, unique mastery that Charles Blood Artistic delivers is seen in the most spectacular fashions to the smallest of details that please the soul. Blood earned his Bachelors of Fine Arts from the University of Illinois and his Masters of fine Arts from Southern Illinois University in Edwardsville IL. You see it's more than just putting a color on a wall. It's training, attention to detail and a genuine understanding of art, light, color and shadows that makes the difference. Charley confers with his customers, understands their tastes and desires and creates their dreams in finishes, materials, textures and color. But make no mistake, no job is to small or insignificant. If it is simply a new look in that old bedroom, Charles Blood Artistic is the right choice for quality, and price. Why choose anything less? When he is not behind the brush or on a scaffold, Charley Blood feeds his inspiration by gardening, traveling, listening to old jazz recordings and has taught adult drawing classes at the St. Louis Art Museum. Interested in seeing more of work by Charles Blood Artistic? Charley would be pleased to meet with you, bring out a portfolio of completed projects and discuss your new project. Just call or click here to contact Charley today!